We are starting this Meet the Maker post with one of the finest natural skin care product brands Wales. 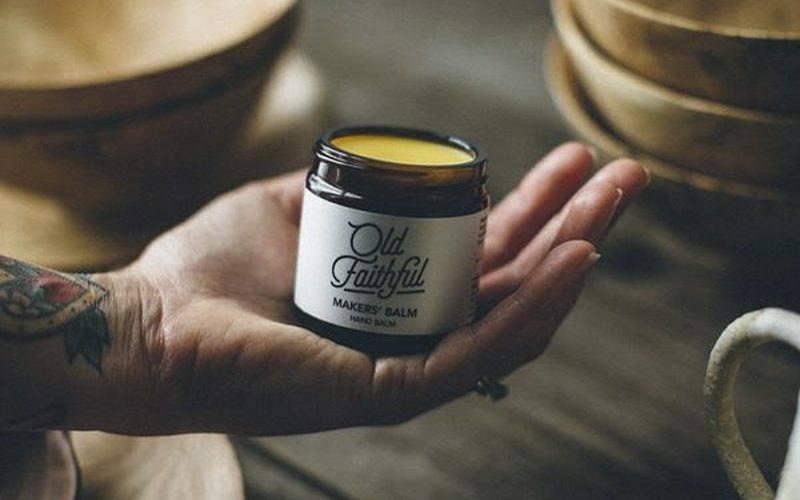 Old Faithful is the aromatherapy brand by the very creative and down to earth Gareth, we are so delighted to have him back with us again at this years Etsy Made Local and we are sure you’ll find at least one or two lovely gifts for yourself or loved ones. My name is Gareth. I am into cooking, yoga and enjoy spending time in nature, especially in the mountains. Making skincare and remedies from natural materials was a natural journey to take considering my interests. I make Unisex & Men’s Organic, Natural Skincare. I am a qualified aromatherapist and my products are made from organic oils, butters, essential oils & herbal extracts. 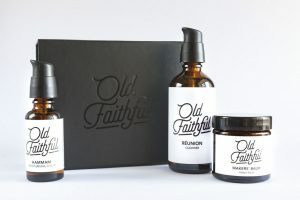 The Old Faithful brand is developing in a masculine unisex direction, and this gentle masculinity matches the natural scents to my products. What skill and techniques do you need to create your products? The main one is a huge curiosity in nature and how these ingredients can heal most ailments we will experience throughout life. There is certainly a skill to making a long lasting balm with a rich, smooth consistency. This comes with practice, patience and some research. The main skill is the knowledge about the ingredients and how they combine and work together. Knowing what works for which conditions and which other ingredients they work well with is key to creating skincare product that works well and feels good. Where did it all begin and where do you see yourself going? It all began when I was stuck in be for a prolonged period of time with a prolapsed disc. I was researching natural ways to help with the pain and to help me sleep better. Essential oils kept on making an appearance, I bought a starter pack and the experiments began. I went on to do a diploma in aromatherapy and natural skincare. I currently sell online, in retail stores around the country and at markets. I would like to keep on growing my customer base through these channels and develop my range of products. 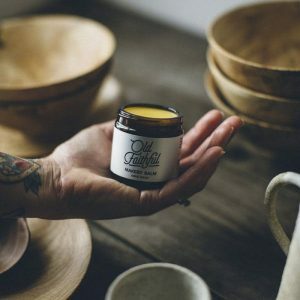 Gareth’s in-depth knowledge and skills certainly shines through in one of our favourites of Old Faithful’s, “Makers Balm” has the perfect balance of bergamot and shea butter to be bother soothing and revitalising. If you’re looking for the something perfect for your favourite bristly bearded person the shaving oil and balm is the perfect combination. What is your favourite part of EML? Meeting the other local makers is really nice and it’s fabulous that we have this support to help sell our craft. If you can’t wait to meet Gareth and his incredible products in person head over to his website, Instagram or Facebook page. In the mean time between product making and his yoga you’ll find Gareth cooking up a storm in the kitchen or rambling the Brecon hillsides. 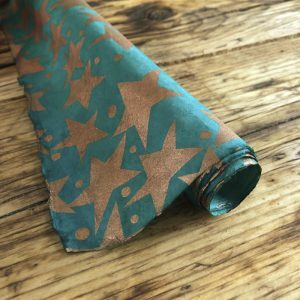 Secondly, we would like to introduce the very lovely and talented Katrina of The Paper Cupboard; paper crafts are by far one of the most beautiful we have seen for wrapping presents and are certainly not to be missed from dressing the Christmas dinning table. I’m pretty much self taught through lots of trials and practice, I’ve learnt how to make Christmas crackers, create origami decorations and how to case books. 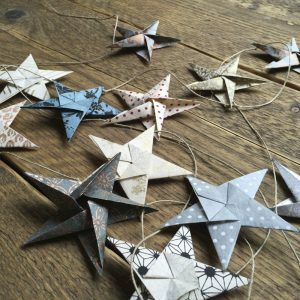 We love Katrina’s origami star garland, just look at how it pulls out the texture and print of the paper, we’re already picturing them hanging around the door ways or along the stairs. What most inspires your creativity? 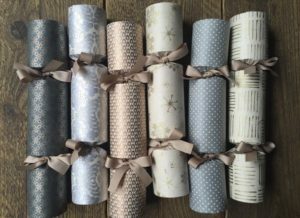 The colours and patterns in our papers inspire me, I like to mix and match them to create our Christmas crackers and garlands. I find it really inspiring being around fellow Etsy sellers and seeing the beautiful products that are on offer. It’s great for finding Christmas presents that are a little different, I’m looking forward to doing a bit of shopping myself. I also enjoy meeting customers face to face. 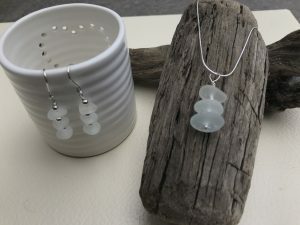 Adding a sense of found art into their accessories, O’r Môr Designs owner Elaine makes the most elegant and mesmerising sea glass jewellery. We have a small case of magpie eye with these as we are in love with the variety of textures and shapes that come with using this material. I am a mum of three teenagers and work as a teaching assistant in a nursery. 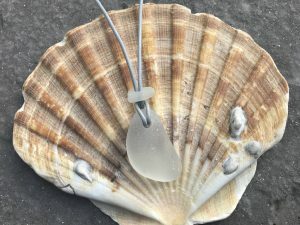 I love to holiday with my family in Pembrokeshire and I have become a little addicted to collecting sea glass and sea worn pottery whilst strolling on the Pembrokeshire beaches. I love to think of the history of the glass or pottery and what it could have been. I mainly make silver jewellery with the items I have collected. I try to keep the pieces simple to highlight the beauty of the sea glass or pottery. I absolutely love making jewellery and find it so relaxing after a hectic day spent with a bunch of 3 year olds! I decided to make something with my finds and made a few bits for family and friends. 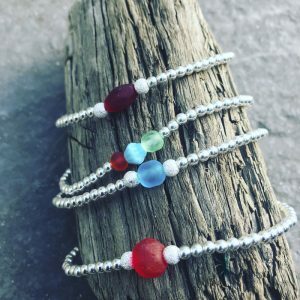 I fell in love with jewellery making and after positive feedback from family and friends decide to set up a Facebook selling page and my Etsy shop evolved from there. I am sill learning new techniques as I’m always looking at ways to better myself. I currently work on my dining table and I’m looking to invest in a caravan or shed to convert into a workspace for my garden. I am looking into silversmith courses so I can develop my designs. 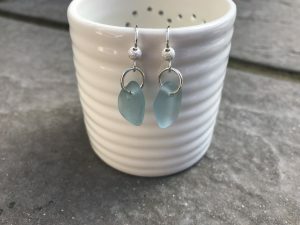 Over at Cardiff and Valleys Creative HQ we are falling head over heals for these lovely turquoise earrings, similar in size but different enough we are reminded of the unique beauty of every day life. This is my first time attending EML and I’m very excited to see all the other stalls. I love to see other people’s creativity and find it very inspiring. By day Elaine loves to relax in her dinning/family room with a cup of tea and by night unwinds with her favourite glass of red. 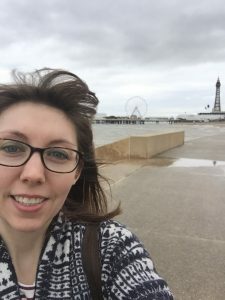 If you don’t fancy chatting over a brew with her and would love to get her work a little more before EML then head over to her Etsy, Facebook or Instagram pages for more insights.